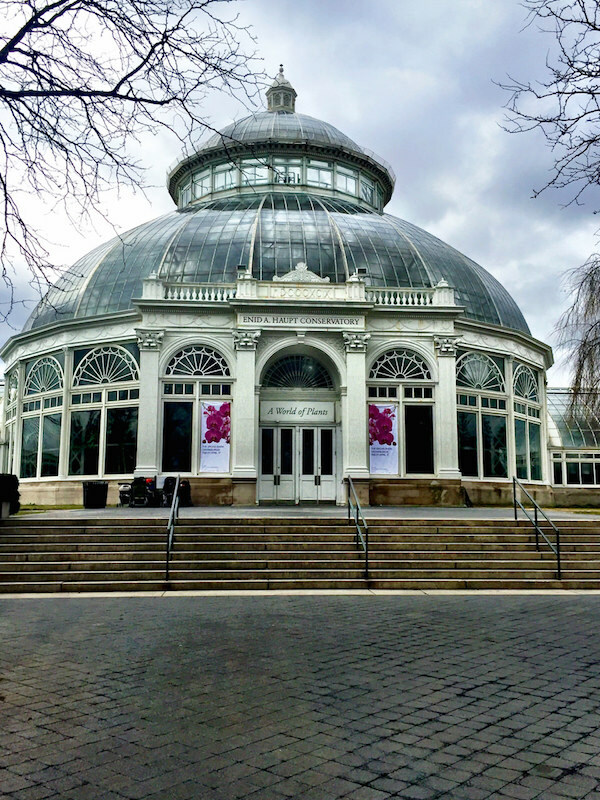 In the splendid Victorian era Enid A Haupt Conservatory at the NYBG, below, the centerpiece of the show, above, is an homage to the similar glass enclosures monied Victorians built to house their burgeoning orchid collections in naturalistic environs. 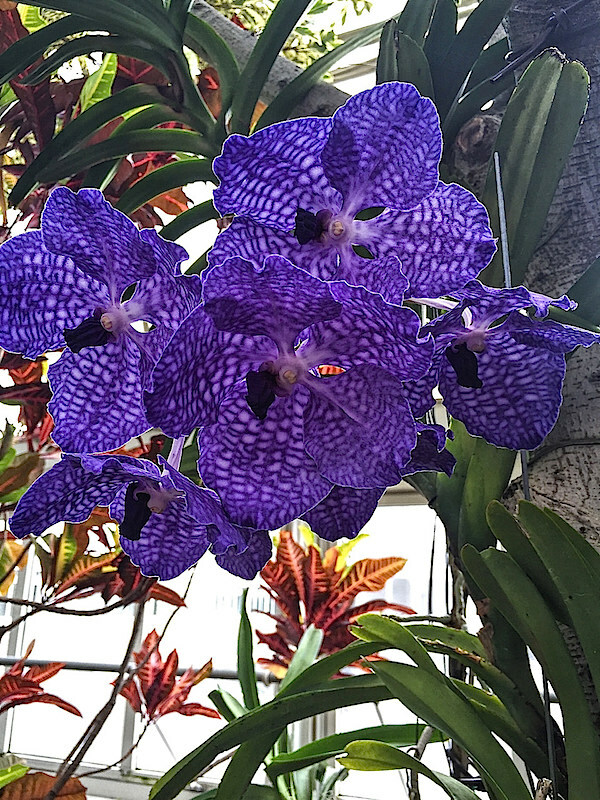 The show highlights the fascinating history of orchid collecting, featuring thousands of orchids displayed similarly as they grow in the wild. The Victorians were fascinated with natural history and, at the end of the 19th century, as people were exploring the far reaches of civilization, they brought back many treasures, often examples from nature. 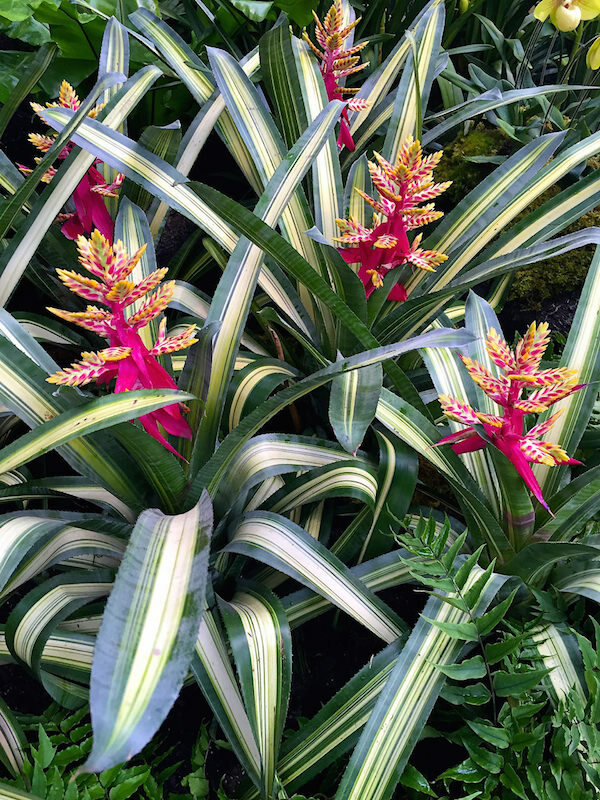 Exotic ferns, palms and orchids were prized possessions, often displayed in homes as status symbols of power and wealth. A single orchid cost the equivalent of tens of thousands of dollars today. This horticultural wealth inspired collectors to search the world for the newest, rarest and most unusual examples. In fact Orchidelirium spawned the profession of orchid hunters, men who made a living traveling for years at a time, finding valuable specimens not only for sponsors’ aesthetic pleasure but for scientific reasons and to supply some of the most famous nurseries of the day. 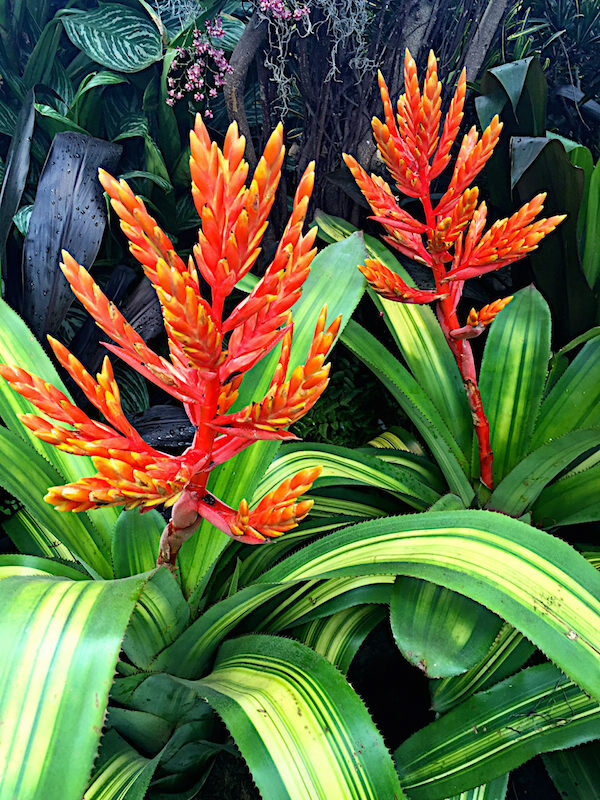 Faced with highly competitive and dangerous missions, orchid hunters encountered shipwrecks, tropical disease and other potential fatalities including unfriendly natives and even mortal threats from fellow orchid hunters. The displays at the show reveal how orchids would have been seen by these early adventurers. It was one particularly unusual species, the psychopsis papillio or butterfly orchid, that contributed to the onset of Orchidelirium. 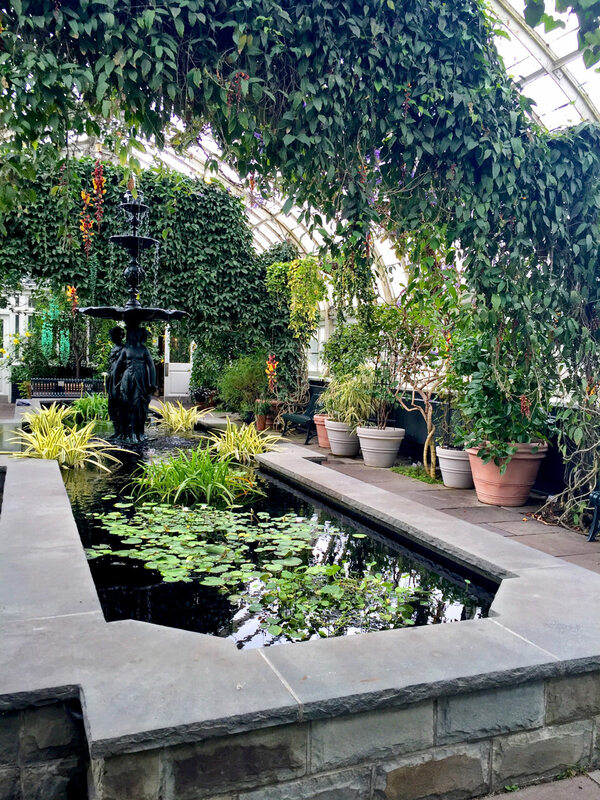 Marc Hachadourian, Director of the Nolen Greenhouses for Living Collections and Curator of the NYBG Orchid Collection, showed us below. 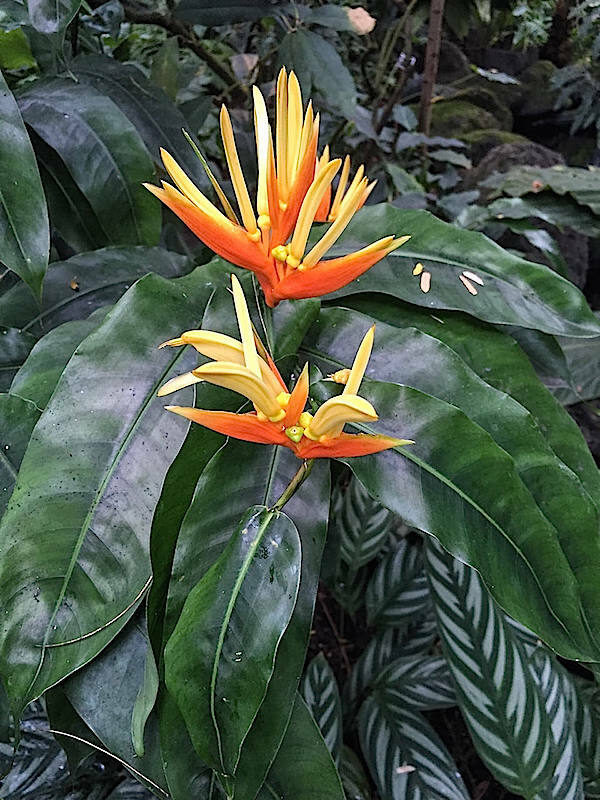 Native to Trinidad, this bloom was brought into cultivation and given to the Duke of Devonshire (of Chatsworth fame), who became so obsessed with orchids that he built his own personal greenhouse (almost the size of the NYBG’s victorian era Enid A Haupt Conservatory). 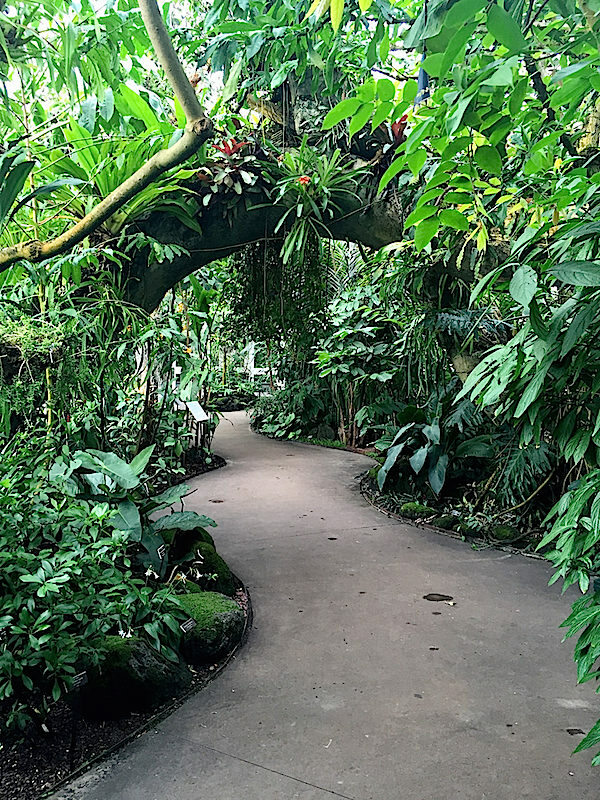 Over an acre under glass, his Great Conservatory was erected to display and collect his enormous orchid collection – one of the largest ever amassed. 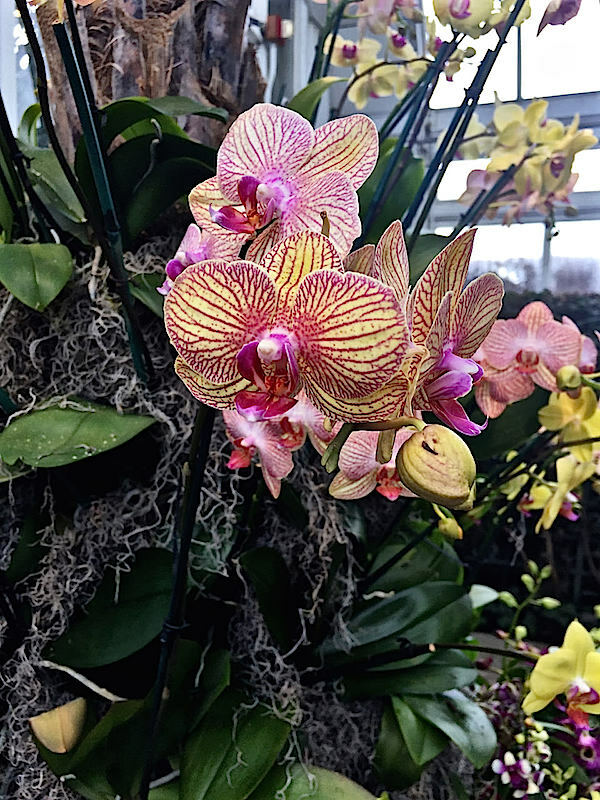 Orchids are the largest flowering plant family with over 30,000 naturally occurring species and over 150,000 man made hybrids. 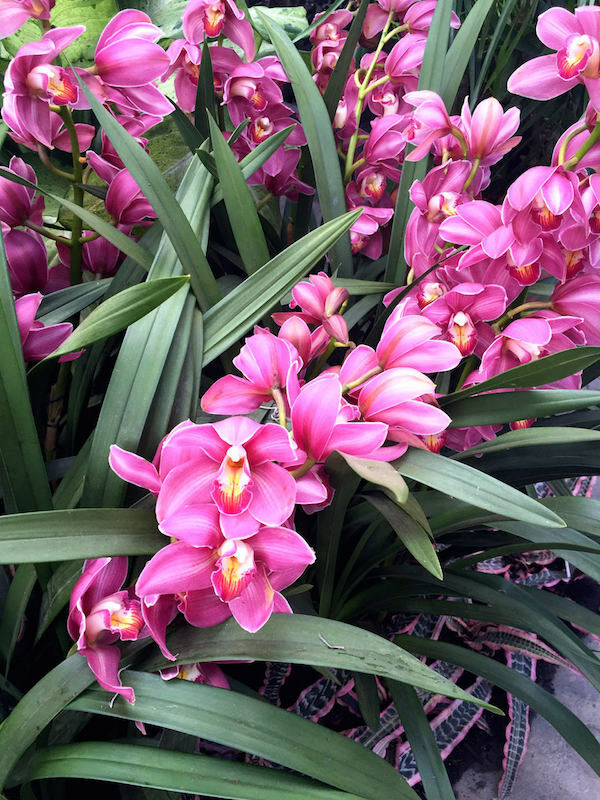 Most of the world’s orchids are found in the tropics but they exist on every continent except Antarctica. In the United States, Florida has the highest number of native orchid species followed rather surprisingly by Alaska. 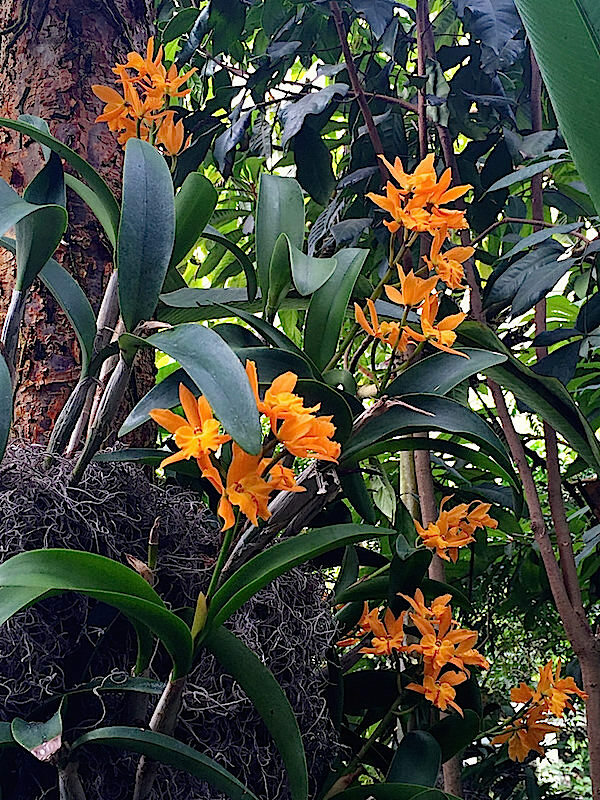 And while the orchid family is wide and diverse, there is only one orchid that really has any economic value – the vanilla orchid. 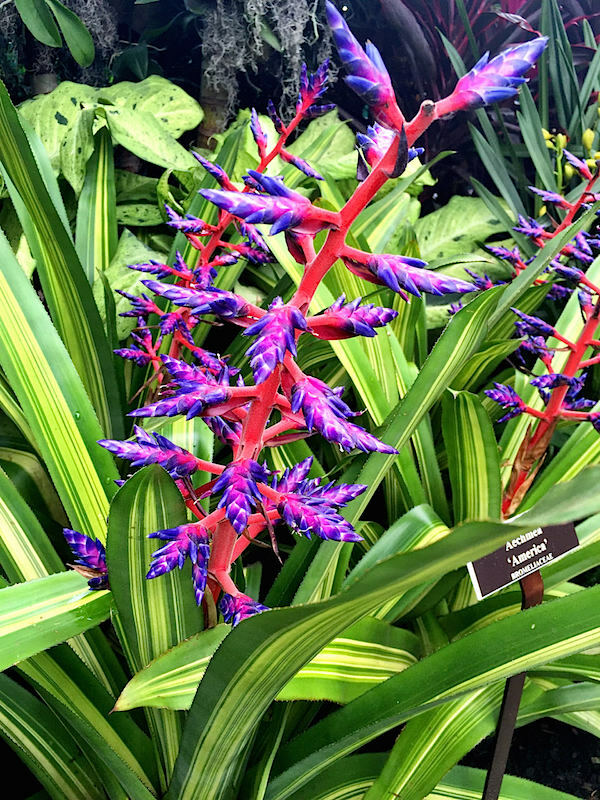 It is the seeds of this plant that supplies the world’s natural vanilla flavoring. 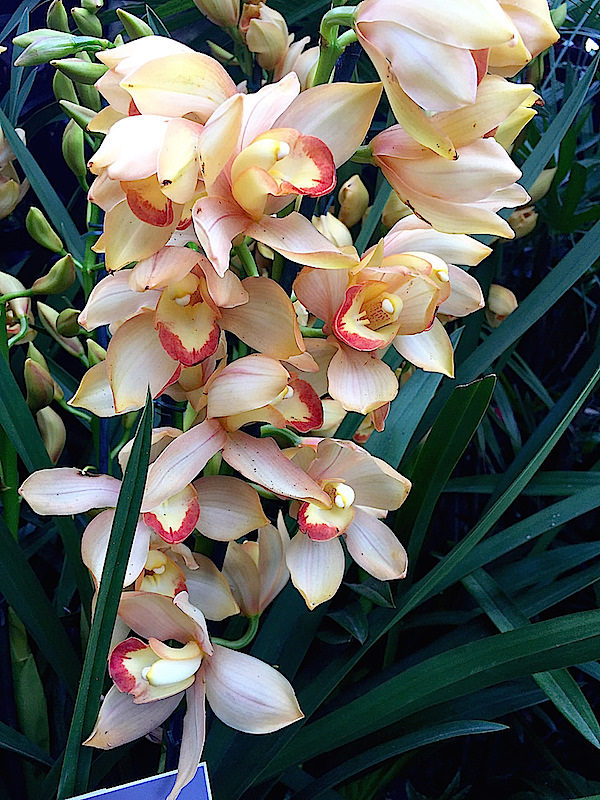 There is a huge range of shapes, colors and sizes of orchid blooms. 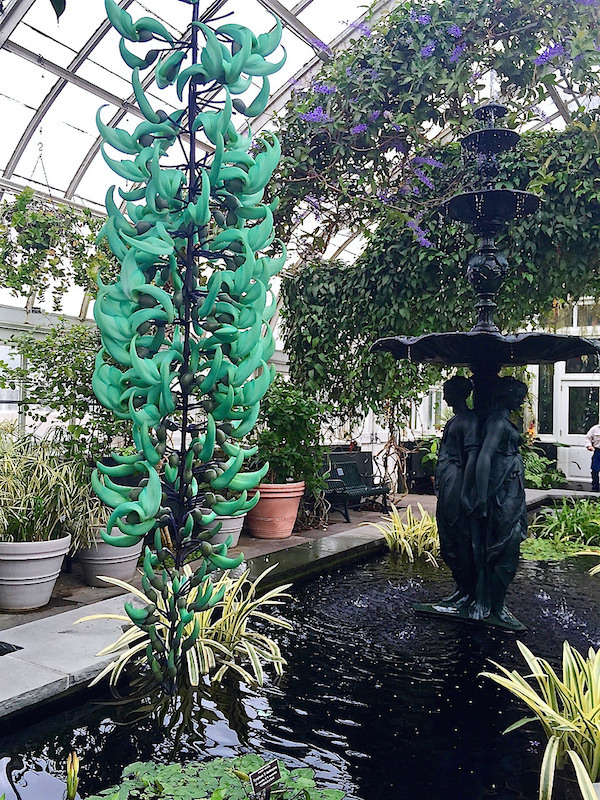 The jade vine, above, a tropical relative of wisteria found in the Philippines, has the most amazing natural turquoise color. Some orchids have miniscule flowers and some with petals that are almost a meter long. Victorians were fascinated not only by the beauty of the orchids but the strange scientific stories surrounding them. While we know Charles Darwin. above, for his theories on evolution, he actually wrote about plants more than any other subject. He was an observational botanist and was fascinated by the intricate pollination mechanisms of orchids. 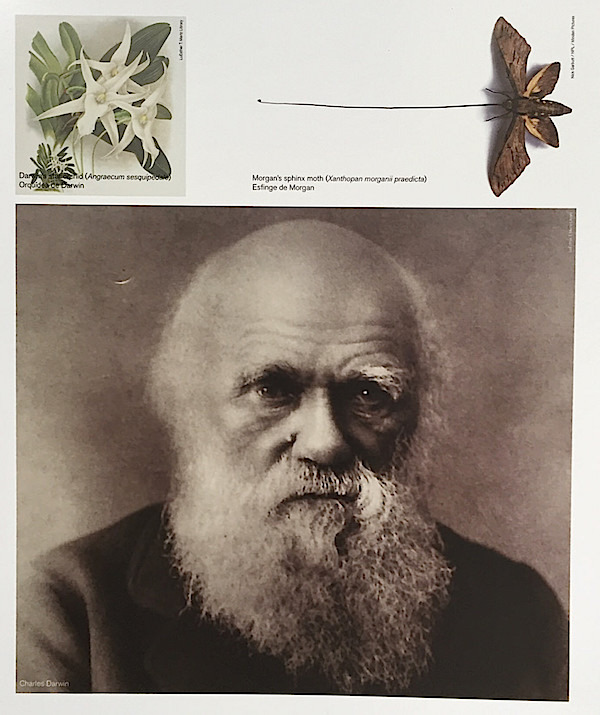 He was presented with the flower of a plant now known as Darwin’s star orchid. A white star shaped flower native to the forests of Madagascar, it has a 12 inch spur off the back, where at the tip is a tiny bit of nectar. Darwin deduced that there must be a moth with a tongue long enough to pollinate the bloom. Considering the prudish nature of Victorian culture, his theory was dismissed, but 40 years later the moth was indeed discovered, and Darwin posthumously vindicated. The Sphinx moth, pictured above, has the largest tongue to body ratio of any animal on the planet! Hachadourian described the making of the annual orchid show as horticultural theater. Starting with a blank canvas, they create, design and install the exhibition in two weeks, a process involving the entire staff of the botanical garden. 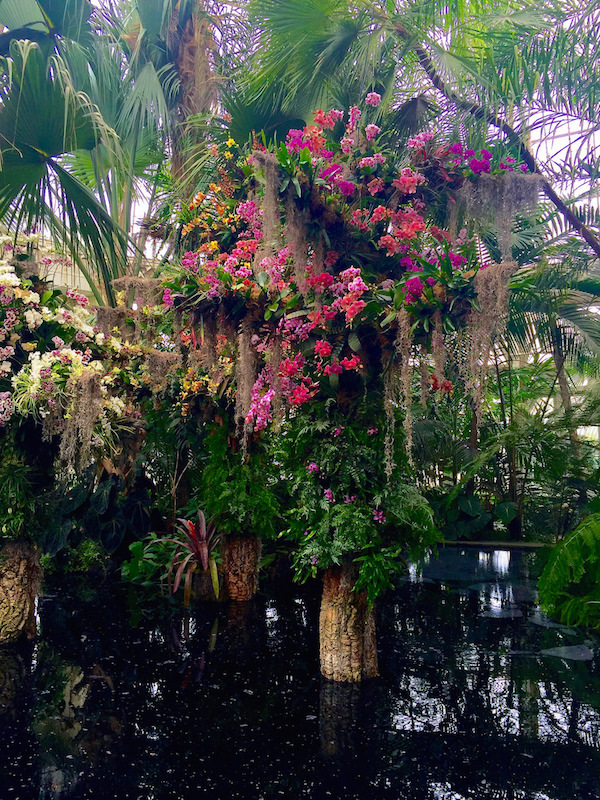 Designed by Christian Primeau, who oversees the tropical/subtropical plant collections in the Conservatory, this year’s effort includes the monumental centerpiece complete with waterfalls. 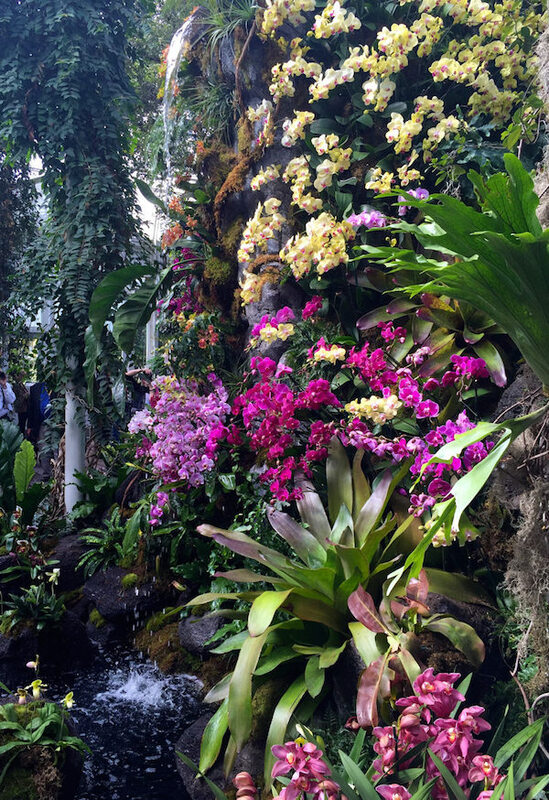 A secret door is built into the structure so the orchids can be watered from the inside. 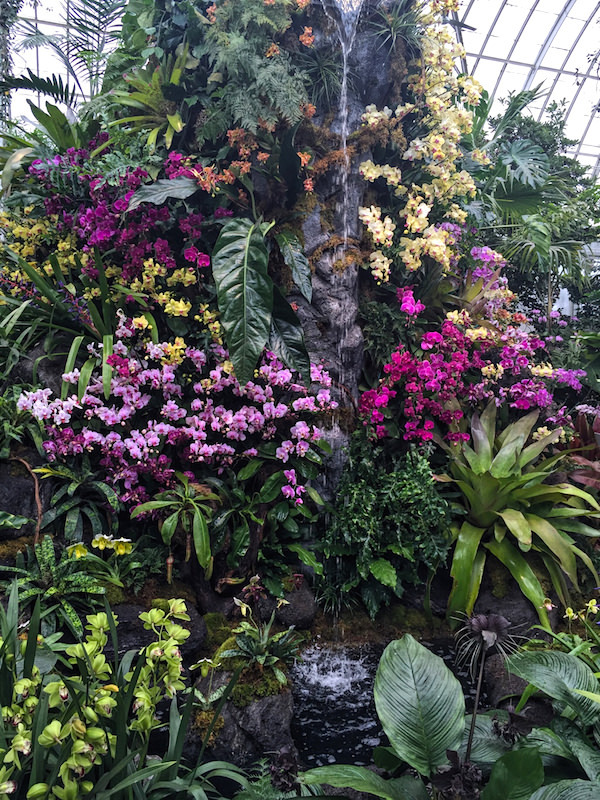 The reflecting pool near the entrance, below, includes trees covered in orchids to begin the story of how these plants went from the wild to cultivation. 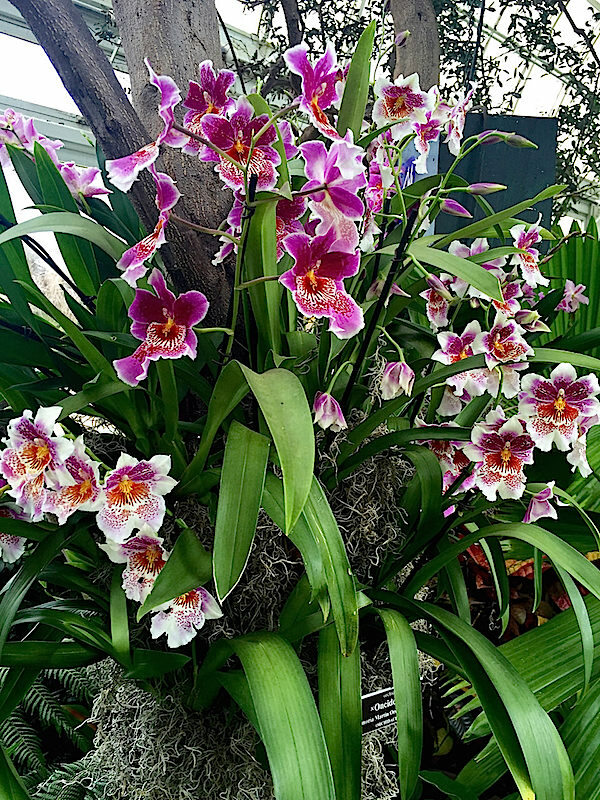 As Hachadourian explained, orchids are the perfect plant to talk about everything that is accomplished at the botanical garden – research, education and horticulture – their tripartite mission. 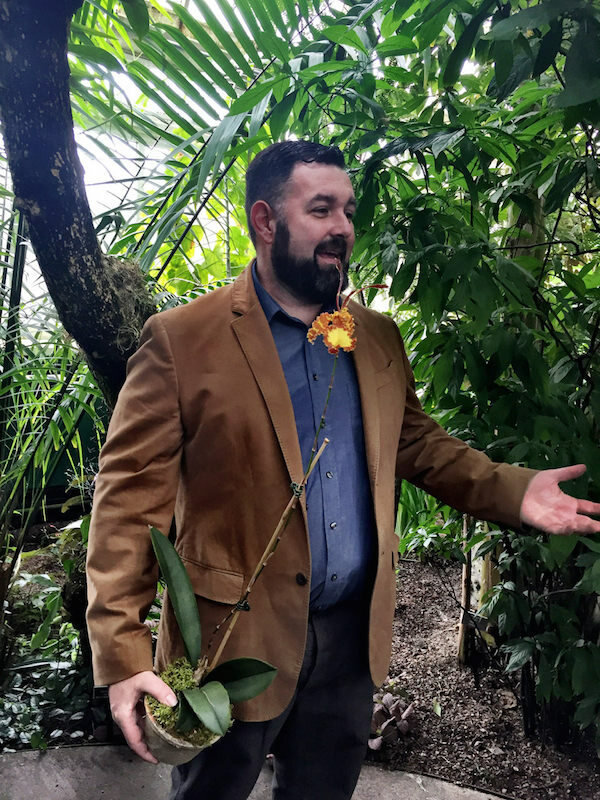 Unlike the early adventurers whose intent was to score as many unusual species at any cost, orchid exploration today is tied to conservation efforts, with the NYBG at the forefront of preservation and orchidology. 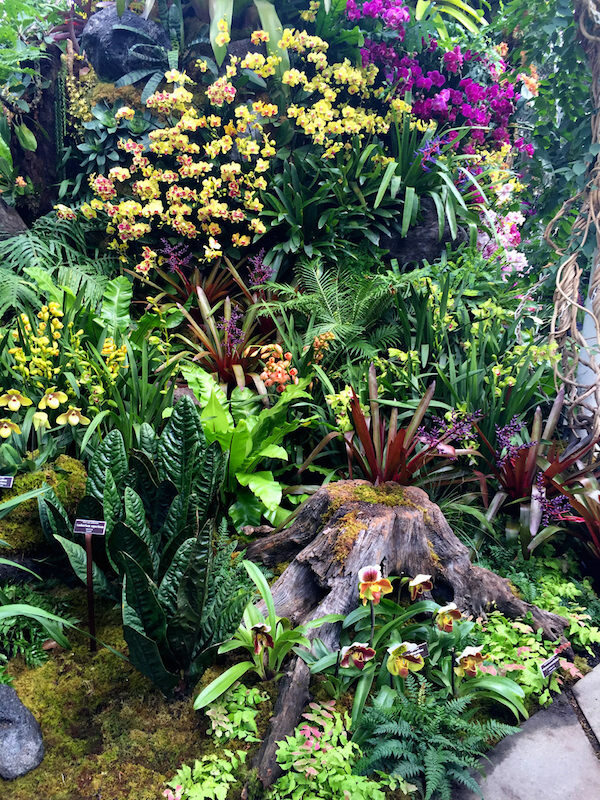 As the New York Botanical Garden celebrates its 125th anniversary, it is the perfect time to see the beautiful and fascinating Orchidelirium show, on through April 17th, as well as visit the Botanical Garden to see its mission in action. This entry posted in design, garden. Entry Tags: Flowers, Gardens, New York Botanical Garden Orchid Show, NYBG Orchid Show, Orchidelirium, Orchids Bookmark the permalink. Stacy, I am sitting here with my morning coffee enjoying this spectacular piece. WOW the sheer beauty is overwhelming. The detailed history you provide is fascinating. Orchids in Alaska ?? Who knew. This is a great continuation of your Orchid Dinner coverage, which by the way was superb. I am now in “Orchidelirium” and can’t wait to see the exhibit. Thank you for providing such beautiful posts. You add so much pleasure to the design and blog world. The biggest pleasure is knowing you. Merci, my dear!!!! Exquisite piece! Can’t wait to see in person. Ok, now I need a greenhouse too! Thanks for all of the inspiration. A beautiful post, and so informative. Blood gorgeous!!! Knowledgeable, succinct, beautifully shot and so much pleasure! Well-done!! 81 queries in 0.565 seconds.